Mold is everywhere: it is in the air and it lives on all kinds of surfaces, from paper to wood to carpets. Household mold is common and house mold can grow anywhere indoors where there is moisture. Molds are not toxic but some molds such as Stachybotrys chartarum, also known as toxic black mold, produce toxins, known as mycotoxins. Some people who are sensitive to molds can experience allergic reactions, including breathing and heart problems, and black mold exposure can lead to severe health problems. Send your Toxic Mold claim to a lawyer who will review your claim at NO COST or obligation. 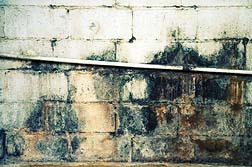 Toxic Mold is mold that contains poisons in its spores. The most worrisome mold, Stachybotrys chartarum (also called Stachybotrys atra), has been labeled by most health departments as a health hazard. Toxic mold is a greenish-black mold that grows on material with high cellulose content, such as straw, fiberboard, dry wall, paper, lint and even dust and it requires constant moisture for its growth. It does not grow on plastics and vinyl. Black mold exposure is also referred to by specialists as one of the causes of pulmonary hemorrhage, known as the "sick building syndrome". Increasingly, black mold has been causing serious problems in homes and buildings in North America. According to the Centers for Disease Control (CDC), some recent studies concluded that approximately 50 percent of homes are inflicted with unknown moisture dilemmas. However, black mold exposure has been known to sicken people for years. During 1993-1994 in Cleveland, Ohio, there was a rare outbreak of pulmonary hemorrhage among infants. Researchers then found out that Black mold was growing in the homes of the sick infants and this incident increased public (and the medical community) awareness of molds in homes and buildings. Toxic mold has also caused problems for homeowners and building managers who must deal with moisture issues. The Environmental Protection Agency (EPA) states that all indoor mold growth is potentially harmful and should be removed promptly, no matter what types of mold are present or whether they can produce toxins. Some people are more sensitive to molds than others and mold exposure can cause symptoms such as nasal stuffiness, eye irritation, wheezing, or skin irritation. Others may develop severe reactions, including fever and shortness of breath. People with chronic lung illnesses may develop mold infections in their lungs. According to the CDC, the vast majority of mold growing in the home or shower is nothing more than a nuisance and does not pose any serious health risks. However, mycotoxins, including black mold, can cause the more serious issues that occur such as breathing problems, lung inflammation, fever, burning sensations etc. They can also be responsible for acute and chronic sicknesses as serious as cancer, fibromyalgia, heart problems, lupus, and even mental deficiencies. Most symptoms can be treated with medication and diet, but to date there is no treatment for the more serious consequences. Lawsuits in the US regarding mold in residential or commercial buildings, and the exposure to their inhabitants, are increasing, mainly due to public awareness of toxic mold danger, and because of the decision by most health departments to label Stachybotrys as a health hazard. Many building owners and homebuilders are finding themselves in toxic mold litigation. Most toxic mold lawsuits involve insurance companies that do not pay for mold-damage claims. However, insurance companies have had to settle claims when they failed to pay for moisture-related repairs that eventually turned into a mold problem. And homebuilders have been successfully sued for bad workmanship that contributed to the growth of toxic mold. If you or a loved one has suffered health problems from exposure to toxic mold, please click the link below and your complaint will be sent to a lawyer who may evaluate your claim at no cost or obligation. I lease a commercial property , I had been sick from symptoms of headache different than the normal headache, fever, chills, numbness, feeling joint weakness since I moved there but I didn't know why until I detected toxic mold inside of the walls while an electrician was doing a job in August in July 2016. I contacted the landlord and she asked me how do I find the mold and who did told me if it's mold. after two weeks she called a restoration to removed the mold but job was unfinished. Her insurance denied my claim for lost, products and vandalize equipment. And Landlord increasing my emotions when she said to me she never have any complaining before although she knows there was a leak prior to the previous tenant but failed to repair it before leasing the premise. I lease the property on May 2016 and I inspect the property and did find the ceiling lights didn't worked properly cause of missing something that I forget the names and also the Ac was not working properly either and my inspector suggested me to present the situation to my Landlord. I opened my door on November 6th 2016 as she wanted to me to open, On December 29th, I observed multiple cracks on my front passenger car widow but I didn't lost anything, the attempt was unsuccessful but the landlord denied the claim. Also before that , my electricity bill was overcharged for surge charge without my consent On 2/05/2017, there was a fire next door and my place had been vandalized and damage not only with fire smoke but also with severe toxic black mold , I was feeling very bad, emotionally damages, rashes was on my left side of my neck, my feet was swollen, rashes and look very bad, my whole left side was very bad that I have picture and I am still not healing yet I didn't know who I was according my feelings, memory loss, discolor of a part of skin, I was very disoriented. I don't know when my tears will be end from inside of my heart, I feel lot of pains All my money went unto this business, It was very beautiful and elegant. There are a wide range of problems which increasing day by day just because of the exposure of mold. One of the main problem is unawareness of health hazards due to mold and people who already exposed have no idea what are the symptoms of mold. The social prevalence of mold is confounding and immeasurable. A legitimate healthy housing survey must be developed and implemented, focused on mold, asbestos, radon gas and urea formaldehyde and afforded to the general public. This survey will help establish the degree of mold as well the other noted viable risks prevalent in society. Form a legislated organization encompassing residential air quality, market it aggressively, and afford specific solutions to mold. Utilize it as a governing agency, which does legislated pre-sale or pre-rent inspections. Provide an ethical healthy home rating scale, and ensure properties with problems are moderated and recorded as required. Provide ethical and legislated legal, medical and scientific avenues of recourse. Make readily available specific medical testing, and treatment for toxic, fungal, particulate, and other mold-related illness. Provide thorough and responsibly legislated sworn real-estate disclosures. Include a mold inclusion as they relate to home insurance policies. Build policy profiles utilizing information gathered to establish a history of a given property. Its purpose would be to identify, correlate, document and record concerns, as well as add a social responsibility towards the issue. Properties holding concerns would have to be excluded from such an inclusion, and be otherwise dealt with. Those eligible would pay a premium for mold insurance coverage, and would be subject to periodic re-evaluations. This mold insurance inclusion should be part and parcel with new home construction sales. Devaluate a property when applicable, rebuilding when required. Design a standard home rating system, and provide a real market value of the property. Enforce a strict building code ensuring structural integrity, efficiency as well as indoor air quality (IAQ). Healthy housing begins with a strategy, and today’s builders will reflect the foundation of such legislation. Legislate, and standardize responsible healthy housing education. Professional, public, and academic education is the key factor. Invoke ethical moldrelated laws, which will protect society’s property and people. Where applicable, impose penalties, fines, and/or jail terms on offenders. Standardize and legislate mold testing procedures. I have been exposed to not only toxic mold, but there is deteriorated fiberglass lining the HVAC ducts it has been adhered to after 40 years of deferred maintenance. I inhaled this toxic waste for two months before moving into a different apt at the same complex. I have been ill for four months. My entire immune system seems be failing. I've had a possible heart attack, coughed up blood or phlegm with black spots in it. Every joint aches, absolute exhaustion, hives, hair loss, swelling of feet, nausea, confusion and more. I seem to recontaminate new surroundings as my clothes hair and personal belongings are covered in slime or other mold now. The mold is in my clothing, on my skin, and even got into my car. My dog has it in her coat, and I have no idea how to get rid of it without total remediation. My landlord has asked me to leave. He knows the entire complex has the problem to varying degrees. It seems that western MD',s at least where I live, have no tests for this. They think I'm a hypochondriac or have some other mental health issues causing me to seek help from specialists. I have an appointment with an NMD who can test me for mold. Where do I go from here? To all those having mold issues, keep a record of it including pictures, bills, etc. and consult with a mold lawyer or personal injury lawyer. My walls have been bent for 5 yrs. When I moved in they weren't as bad as now. I've been telling the property manager since I moved in that the livingroom wall is pushing out and there's a huge lump in my livingroom wood floor. They came and cut the hump out nailed screws in it and covered it with a new floor. As years passed and they continued to ignore me about water sitting in the wall it continued to push out more and more. I grew mold all over the bathroom and my bathroom floor became very weak. They still did nothing. My son was getting bad headaches and my body aches started getting worse but my doctor didn't know what was wrong. I started losing my hair as well as my dog and my grandson kept getting a fungus on his head and his Dr didn't know from what. Well they take my livingroom wall down 3 weeks ago and my insullation is black and yellow. There is mold all over it. They wouldn't pay for us to stay in a hotel even though we let the property manager know this. They left the wall down while we still lived there. 3 weeks later they finally transferred us into a new apartment since I contacted HUD.I was able to now tell my Dr about the mold and I tested positive for an autoimmune disease fibromyalgia. I see this is liked to mold so I did a home mold kit and the mold grew all over it. I sent it off for testing. I go to UCONN next week to see a specialist but for now I'm on 3 different meds for pain and swelling that don't work. They just put me to sleep. I'm a server and I'm in so much deep aching pain everyday that I may have to quit my job. I'm trying to hang in there but the pain gets unbearable not to mention that my doctor said it affected the bottom of my spine that's why I can't sit up against anything my lower back is very tender to the touch. I have so many symptoms from mold and to find out fibromyalgia can come from that has me really pissed because my life is ruined and the property manager nave cared to look into this no matter how many times I complained. I have no place to live. I have health problems. I may have to pay fees because I had to cancel my utility bills. Most of my belongings are still at the apartment and probably contaminated by mold. The landlord is acting like this is my fault. Sick for weeks/months, letter from doctor stating I'm being treated for mold exposure, lost family cat to mold exposure, being evicted because of complaining to the health department and landlord won't cooperate. Sickness includes memory loss, headaches, nose bleeds, nausea, diarrhea, bronchitis, sinus infection, asthma/trouble breathing, etc. My children have had extreme breathing problems and have been on steriods, antibiotics, nebulizers, and oxgygen repeated amount of times due to this. My apartment manager will not do anything about it. I have not been able to work due to my kids being sick all the time. I am also 6 months pregnant and have asthma attacks repeated amount of times.